Though no official survey exists, UK is one of the few countries around the world where each detention centre has a dedicated visitor’s group, in addition to other groups who visit formally and informally multiple centres. Hundreds of people must be regularly visiting those held in detention centres, but what does visiting really do? Sonja Miley of Waging Peace write how she found an answer to this question, during her very first visit to Yarl’s Wood. Dr. Amara turned up for her weekly obligatory immigration sign-in when she was briskly and without warning taken into custody, with only the clothes on her back and the items in her possession. Without warning she had her personal belongings taken away, she was held for several hours in a locked room and then bustled into a van for the journey to an unknown destination which turned out to be Yarl’s Wood IRC several hours away. Upon being re-detained, as in Dr. Amara’s case, the psychological stress and trauma increased infinitely when she was also given removal directions with an airline ticket within a week to return to Sudan; to the same situation, the same government, the same country she risked life and limb to flee. Return would almost certainly cost her her life. This is not a scenario from long ago nor is it depicting life in a faraway land. This is a true account of what happens on a daily basis in 21stcentury Britain. We need to start talking about detention. It was a cold January day when we visited Dr. Amara at Yarl’s Wood IRC, an immigration detention centre in Bedfordshire just outside London. Waging Peace operates a Sudanese Volunteer Visitor’s Group matching trained volunteers to meet people in detention to provide non legal yet hugely and vitally important emotional support; human being to human being. Very often there is a language barrier which makes it difficult for non-Arabic speaking individuals to provide the kind of support needed but Dr. Amara was fluent in English and this particular instance called for a visit from my colleague and me specifically – both of us non-Arabic speakers. 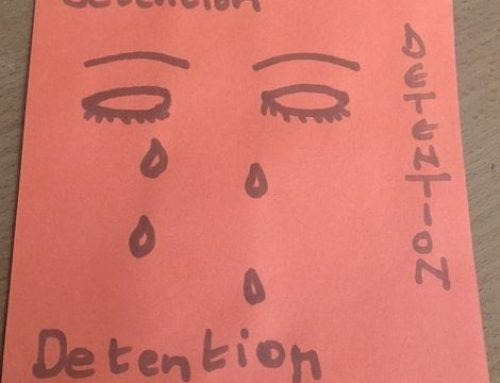 This was my first visit to a detention centre and I had no idea what to expect. And I was nervous and tense. I mean, how can I really help? What can I do? As I prepared to meet Dr. Amara, the impact the detention centre would make on me blindsided me. It wasn’t the back of beyond physical location of the detention centre that initially got to me, nor was it being bussed-in by a small van to a walled up, barbed wire fenced-in facility. It wasn’t even the cold and unwelcoming reception from the front desk staff who only allow you to proceed with your visit once your fingerprints and official photographs are taken and stored on their system. It was the general atmosphere. I was shocked at how prison-like the operations were. This continued as I observed stark barren walls with the exception of one or two signs posting stern warnings that no visitor was to take anything – not a pen or paper, not an offering of food, not a book, not a sliver of any humanity from the ‘outside’ world, not even your own belongings – into the visitor lounge. The only thing allowed in your pockets is change in coins up to and strictly no more than £10. A small number of lockers are available to store your personal belongings and if they are already full or you don’t have a pound coin to hand, there is no other recourse. I didn’t have exact change so went back to the front desk but my request was met with unhelpful shrugs of “sorry, we can’t help”. I had to remind myself that the woman I was about to meet was not a prisoner, she was a person, who happened to be an asylum seeker under humanitarian grounds fleeing extreme conditions in her home country after being victimized by her own government and subjected to torture, sexual violence and traumatised. I finally sorted out the storage of my belongings and was now free to wait in line to enter, one by one, into a small and secure room with an officer and an x-ray scanning machine. After walking through the x-ray machine, I was given a pat down by the officer and asked to take the coins, up to £10 only out of my pocket to be counted. When the officer was satisfied, she unlocked the door to the visitor lounge and finally I made my way to find Dr. Amara. But how can I help I thought? What can I do? I smiled as I approached Dr. Amara and warmly extended my hand. She returned my smile with a sense of sadness and despair and with no other words she collapsed into sobs into my arms. I gently embraced her and when she was ready, we sat down and talked for the next two hours. It was finally clear to me. The value of a volunteer is not in what we do. By meeting people where they are, we don’t have to ‘do’ anything. Dignity, comfort, care and empathy are the outstretched arms of humanity. In detention, humanity is stripped away through every locked door, through each pair of eyes watching your every move even in your most intimate moments. You fear being alone. You fear being with anyone else. You lose hope. And despair is a false friend which hovers near as you have no recourse to knowing when release may come. The UK is the only remaining country in Europe that still does not have a time limit #Time4aTimeLimit so people exist from day to day in no-man’s-land. What did my colleague and I do that day? 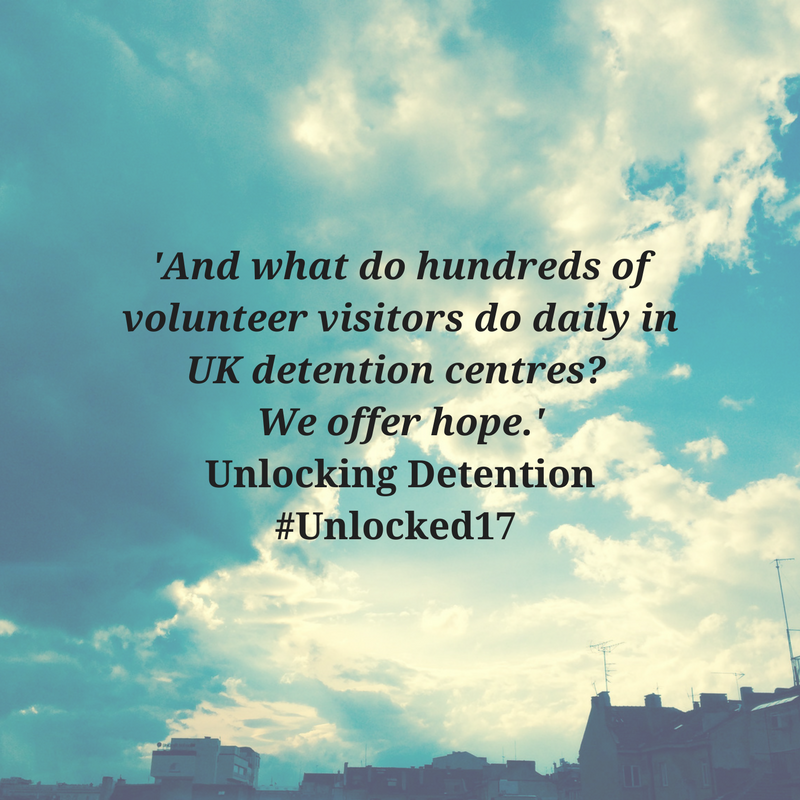 And what do hundreds of volunteer visitors do daily in UK detention centres? We offer hope. Hope that someone is watching. Hope that someone is fighting with them. Hope that someone cares. Hope that they will be heard. Hope that they are not alone. For more information about detention visiting, visit AVID website here.